To promote the Dinomania exhibition at Bristol Zoo we were asked to cook up a family friendly (not to carnivorey!) show to take out and about the South West. We formed a keen team of ‘Dino Rangers’ to accompany ‘Denzel’ – an animatronic ‘Zooosaurus Rex’ brought to life by our professional puppeteers. 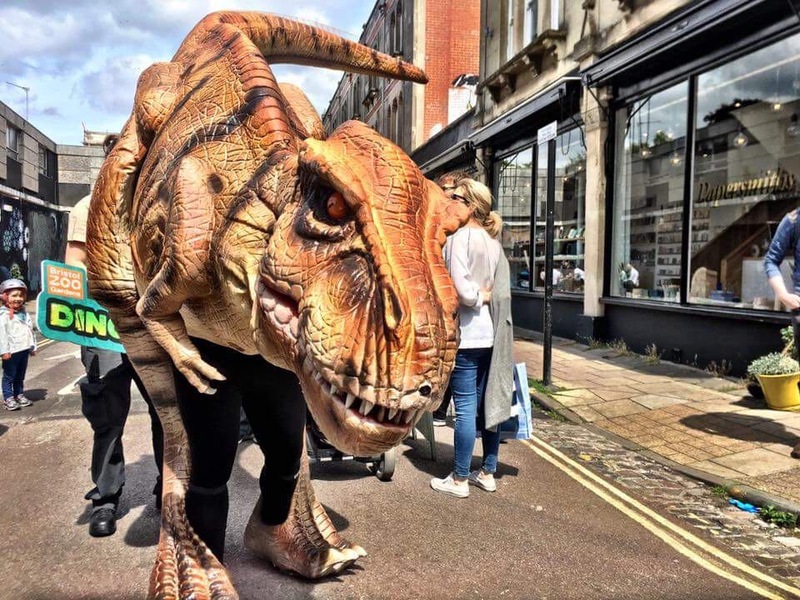 Over the three month tour Denzel and the Dino Rangers won the hearts of thousands of people in schools, offices, shopping centres, festivals and even a chip shop! Our roarsome rangers took our scripts and tailored them for all ages – creating sensitive scenes for little people, and find the right level of FRIGHT for the more fearless folk! We were sad to see Denzel depart at the end of the tour, but are happy to say that he is currently being fed bad boy pot noodles by the workshop team and is ready to take to the streets again at the drop of a bone!